Clarence J. Robinson was a successful Northern Virginia businessman who had tremendous interest in the education of the area’s citizens. In 1939 he founded the Robinson Terminal Warehouse Corporation in Springfield, and in 1957 he became president of the First and Citizen Bank in Alexandria. Robinson joined the George Mason College Advisory Board in 1964, and served as its chairman until 1970, while also making generous donations to the school, including some real estate property in the early 1970s. 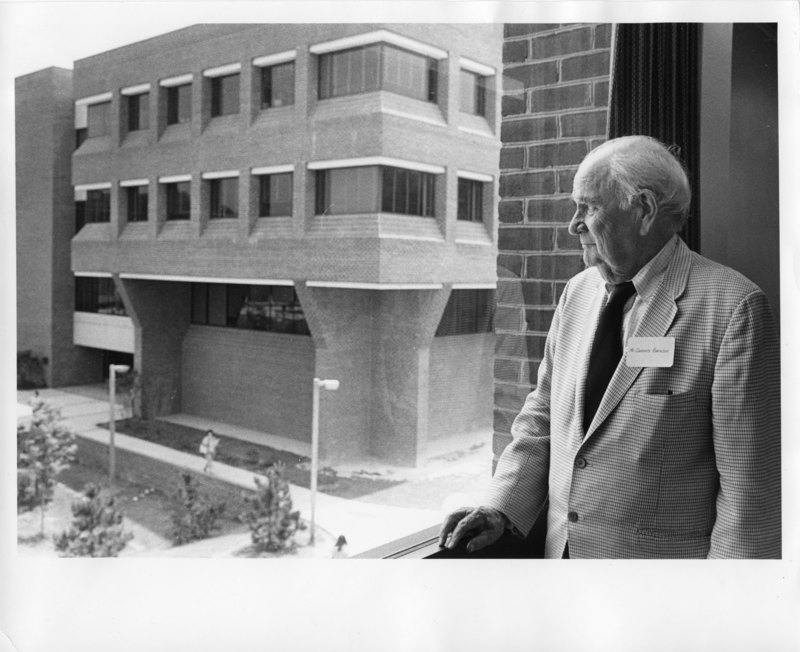 In 1975 George Mason University’s Academic II building was renamed Clarence J. Robinson Hall in his honor. Upon his death in 1983, Robinson’s will stipulated that half of his estate was to be given to George Mason University. However, just before his death, Robinson made clear that he had specific plans for how the money was to be used. Dr. George W. Johnson, who became president of George Mason University in 1978, had quickly become good friends with Robinson when they first met. As his final years approached, Robinson discussed the bequest from his estate with Johnson. Robinson told Johnson explicitly that he did not want the money to be spent on buildings, but rather on people. Robinson felt that if exceptional faculty members came to the University, the buildings would follow. After Robinson’s death, Johnson initiated one of the most well-known institutions at the University today. In 1984, President Johnson began the Clarence J. Robinson Professors Program. Funded by Clarence Robinson’s gift, the program sought to attract renowned professionals and academics from various fields and disciplines to teach undergraduate courses at Mason. There was no specific academic or professional background necessary to qualify as a candidate for a Robinson Professorship; the only requirements were that a candidate display a commitment to undergraduate education and that he or she not seek to use their university position for their own ambitions. Dr. Johnson’s plan was that the program would host approximately fifteen professors at any one time, but he soon found it difficult to gain interest among academics. Johnson asked himself how he could convince professors from some of the top universities in the world, such as Harvard or Princeton, to come to George Mason, which at the time, was still largely unknown. Johnson thus began to promote what he described as his “clean blackboard” policy, which meant that professors would have complete control over courses and their curriculum. While certainly more common in higher educational institutions today, this was a radical and untested concept in 1984. Just as Johnson suspected it would, the strategy worked, and soon many academics were interested in being a part of the program. While most of the university community was thrilled at the idea of distinguished academics coming to Mason, there was a small faction who opposed the program. Faculty members who had been a part of George Mason for many years felt that the funds set aside for the Robinson Professor Program should instead be used for existing faculty. Disgruntled faculty members even threatened to march on Richmond in order to obtain what they saw as rightfully theirs. Still Johnson refused to back down, and continued forward with plans for the program. Among the first Robinson Professors were: Dr. Shaul Bakhash, a Harvard and Oxford-trained author specializing in the history of the Middle East; Professor Paul D’Andrea, a Harvard PhD. scholar and playwright; musician and scientist Dr. Robert Hazen; Dr. Hugh Heclo, a government and public affairs specialist; biophysicist Dr. Harold Morowitz; Dr. John Paden, a former Rhodes Scholar with credentials from Oxford and Harvard specializing in public and international affairs; physicist and author Dr. James Trefel; and Roger Wilkins, a Pulitzer Prize-winning journalist who served in the Justice Department during the Kennedy and Johnson administrations. Since the start of the program, the Robinson Professors have maintained their offices in the East Building, one of Mason’s original buildings constructed in 1964, while conducting their classes at locations throughout the Fairfax campus. Many of the newer academic buildings on campus where the Robinson Professors teach, such as the Nguyen Engineering Building and University Hall, were built decades after the program began, echoing Clarence Robinson’s belief that “you need people before the bricks and mortar.” Decades after his death, Clarence J. Robinson’s name and legacy live on at George Mason University, and the program which bears his name will ensure that undergraduate students at George Mason University are offered the best educational opportunities available. Browse items related to Clarence J. Robinson.